With the Olympic Games only a day away, the rays of Grecian sun are warming the Olympic torch in preparation for tomorrow’s lighting of the flame at the site of the ruins of Ancient Olympia. April 21 also marks the official Olympic debut of Eleni Kyriacou's costumes for the revered torch ceremonies – and being here in Olympia myself, I will be witness to the epic occasion. A designer that I both admire and wear, Kyriacou’s collections are always inspired by a central theme and her research into each collection has become an integral part of the design process itself. Because of this her collections stand by themselves. Collections such as The Sacred Lotus, Gabos Female, The Amphipolis Muse and 12 Greek rectangles feel as fresh as when I first saw them, and are pieces that can be worn time and time againand still exude that WOW factor because of their integrity. 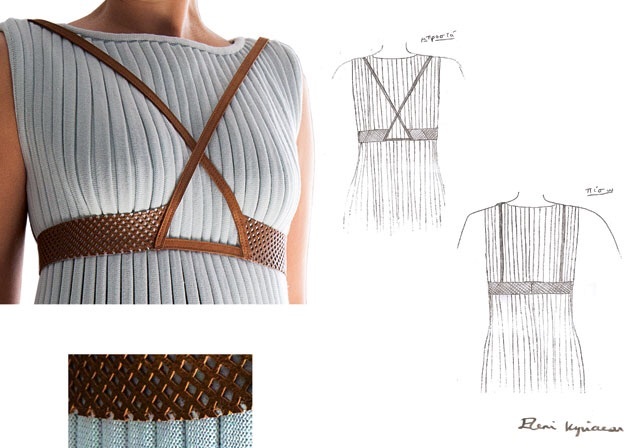 Of course creating costumes for the torch ceremony is not quite the same as designing your own collections. The volume of work is huge and includes dressing a high priestess, as well asanentourage of over 80 male and female individuals of varying shapes and sizes. Kyriacou though has tackled it much in the same way she does with her collections; with thecentral core theme being Classical Greece. Using the chiton as a base, Kyriacou has moved away from the longstanding plain white colour-scheme of ancient Greek fabrics, instead introducing a broader chromatic palette of light-turquoise, light-blue, brown and olive green, influenced by the Greek landscape. Rhythmic patterns are created through an inner layer of pleats revealed only through movement. In keeping with Kyriacou's sensitivity in her use of texture, all the costume dresses are made of Merino wool; while leather, suede and fur have been used in the design of the girdles and garlands in the costumes for both for men and women. As a designer who regards her collections by inspiration rather than season,we look forward to the result of the 'Olympia' effect in her forthcoming limited edition ollection due to be unveiled in May.